Hello Aspirants, looking for NCC 45 Entry recruitment Indian Army 2018 so we have a good news for you soon Indian army will be announcing recruitment for Married/unmarried MALE and unmarried FEMALE candidates and also from Wards of Battle Casualties of Army Personnel who hold NCC C certificate can apply for this entry. 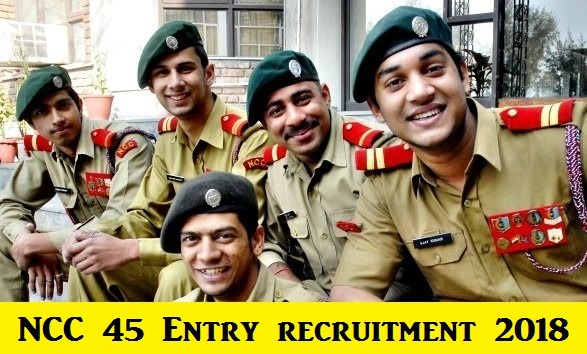 Indian Army Recruitment NCC 45 Entry. Eligible and Interested candidates can apply on or before th 2018. Feel free to ask questions below in comments. NCC (National Cadet Corps) is the Indian military cadet corps with its head Quarters at New Delhi. It is open to school and college students on voluntary basis.The National Cadet Corps in India is a voluntary organization which recruits cadets from high schools, colleges and Universities all over India. Indian Armed Force Branches – Air Force, Navy and Army give special entries for the NCC C Certificate holders. Candidates withdrawn on disciplinary ground from NDA, IMA,OTA or any other Service Training Academy are NOT eligible to apply. For NCC ‘C’ Certificate Holders. (1) Degree of a recognized University or equivalent with aggregate of minimum 50% marks taking into account marks of all the years. (2) Those studying in final year are also allowed to apply provided they have secured minimum 50% aggregate marks in the first two/three years. Such students will need to secure overall aggregate of minimum 50% marks if selected in interview failing which their candidature will be cancelled. Chennai. Such candidates will be inducted for training at OTA, Chennai on additional bond basis for recovery of the cost of training as notified from time to time as well as stipend and pay and allowances paid, in case they fail to produce the requisite degree certificate. Candidate should attach self attested photocopies of the certificate of 10th class for proof of age, Degree with all years/semesters marks sheets and NCC ‘C’ Certificate. Candidate should also attach certificate with their applications regarding CGPA converted to aggregate percentage of marks as per university rules from their institutes. Service in NCC. Should have served for minimum two academic years in the senior Division/ Wing of NCC. Grading. Should have obtained minimum of ‘B’ Grade in ‘C’ Certificate Exam of NCC. How to Apply Online for NCC Entry ? Now, Click on Officer's Entry "APPLY/LOGIN" and then Click Registration. Follow the instructions for registration. Fill all the details completely and carefully. After that Click on 'APPLY ONLINE' where a page of "OFFICERS SELECTION ELIGIBILITY" will Open. After getting Eligible from your Registration Details Click on APPLY and Start filling the Application Form. Keep filling details and Keep Saving and Continue to the next segment. After reaching to the final segment of data filling you will get "SUMMARY" where you can check all the details filled by you are correct once form Submitted no changes can be made. After this you can download the PDF and take 2 copies of it where you will get system generated Roll Number and also you will get a SMS on your Mobile Phone and a Mail. You Need to carry this PDF at the time of SSB. NOTE: No Need to Send any Hard Copy to Directorate General of Recruiting. ONLINE APPLICATION WILL OPEN ON 2018 AT 1000 HRS AND WILL BE CLOSED ON 2018. 1. All applications are to be forwarded to Recruiting Directorate (NCC Entry) through HQ Directorate General NCC. The NCC Units/Group HQs will forward the applications to State Directorates who in turn will forward the same to HQ Directorate General NCC. 2. Thereafter through screening/Shortlisting of applications based on qualifications of the candidates will be carried out by the NCC Directorates and HQ Directorate General NCC. 3. Candidates not in receipt of call letter from any of the Selection Centres for SSB interview should presume that either their applications have been received after due date or have been found ineligible or rejected during shortlisting. No correspondence in this regard will be entertained. 4. Candidates after shortlisting will be called for SSB interview by Directorate General of Recruiting. The decision of Headquarter Directorate General NCC and Directorate General Recruiting in Army HQ, in the matter of Shortlisting and forwarding of applications to SSBs will be final. 5. On arrival at the Selection Centre the candidates will be administered stage-I of the two stages testing procedure. 6. Candidates failing in stage-I will be sent back on the same day and those who qualify will be detained to undergo Group Tests. Psychological Tests and Interview which will extend for a duration of 5 days. 7. Candidates recommended by SSBs will be required to go through Medical Exam. 8. Candidates who are found medically fit will be placed in order of merit as per the marks obtained in SSB interview amongst the recommended candidates. Boarding and lodging during interviews at SSBs are free. 8. Recommendation by SSB confers no right of admission to the OTA, Chennai. 10. The final selection will be made as per the order of merit subject to medical fitness and suitability in all other respects and number of vacancies available. 11. The merit list of the recommended candidates will be displayed at the reception of Directorate General Recruiting and Directorate General Recruiting website of Indian army i.e. www.joinindianarmy.nic.in. This was all about NCC 45 Entry 2018 Scheme . Eligible and Interested Candidates can apply online for the NCC entry 2018 from the Indian army official website. Candidates can also subscribe us to get all latest updates direct to email I'd or can follow us on Facebook for latest notifications. Feel free to ask below in comments regarding NCC 45 2018 entry.